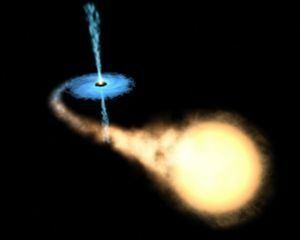 Artist's conception of a binary system consisting of a black hole (upper left) and a main sequence star (lower right). The black hole is drawing matter from the star via an accretion disk (blue) around it, and some of this matter forms a gas jet (also blue). A black hole is a theoretical formation in space with near-infinite density and sufficient gravitational force that escape velocity exceeds the speed of light. Thus, "black" refers to the impossibility of any light (photons) escaping, thereby making them completely dark. Black holes are increasingly promoted by liberal publications, such as the science page of the New York Times, glossy magazines, and movies including Event Horizon (1997), The Black Hole (TV, 2006), and Interstellar (2014). Black holes fail the falsifiability requirement of science, because it is impossible to prove that they do not exist anywhere in the universe. Before 2019, black holes had never been directly observed, and there was no direct evidence for their existence. In early 2019 astronomers released the first ever image of a super-massive black hole located in the galaxy Messier 87 - some 55 million light-years away. That black hole has since been informally named "Powehi". Evidence for the existence of black holes relies on the observations of radiation from accretion disks, motion of stars near the center of the galaxy, and "gravitational lensing," around places where there are no visible objects. Most the evidence for the existence of black holes relies on circumstantial evidence, with heavy reliance on theoretical equations. Because of quantum-mechanical phenomena involving Hawking Radiation, discussed later in the article, black holes must emit radiation and thus are not perfectly black. Nevertheless, they are called "black holes". Quibbling about this is similar to quibbling about the statement "The Earth is round". Black holes are conceptually associated with "wormholes", which never caught on with the public, perhaps due to its unattractive terminology. 11 Are Black Holes Falsifiable? This is a concept of gravity, under General Relativity. For any normal object, from things one would see on Earth up to stars that are not extremely massive or dense (much more massive or dense than the Sun), the Schwarzschild radius is very tiny relative to the object. This means that the object does not lie inside that radius, and cannot be a black hole. For example, the Schwarzschild radius of the Earth is about one centimeter, and that of the Sun is about three kilometers. The Earth could only become a black hole if it were compressed into a radius of one centimeter. What makes the Schwarzschild radius significant is that the behavior of gravity, under General Relativity, is determined by the Schwarzschild metric, and is (not surprisingly) nearly identical to the behavior given by Newton's law of gravity. The difference only shows up at distances at or near the Schwarzschild radius. If the Earth were compressed to a radius of one centimeter or less, the behavior of gravity would become radically different as one approached that distance. Normal world-lines would cease to be "time-like", and such world-lines would be unable to make progress from inside the Schwarzschild radius to outside of it. This is a rather paradoxical situation when viewed in the way we normally view the way the universe works. In short, no object, and no light, can actually pass from inside the radius to outside. The surface at this radius is called the event horizon. The concept of the Schwarzschild radius was worked out by Karl Schwarzschild in 1916, as part of his solution (the first solution ever worked out) of Einstein's field equation for General Relativity. At first, neither Einstein nor Schwarzschild believed that something could be so dense that these objects could exist. The notion of something that has gravity so strong that light can't escape actually dates back to the 18th century, when scientists became aware of the finite speed of light and the concept of escape velocity. The corpuscular theory of light held that light was made up of invisibly small particles, and that these particles moved along ballistic trajectories, like tiny bullets. In this framework, it was believed possible that a distant star could be so massive that light emitted from its surface would be dragged back down again. This theory was first advanced by John Michell, who wrote in 1783, "If the semi-diameter of a sphere of the same density as the Sun in the proportion of five hundred to one, and by supposing light to be attracted by the same force in proportion to its mass with other bodies, all light emitted from such a body would be made to return towards it, by its own proper gravity." Suggesting the same possibility independently, Pierre-Simon Laplace wrote in 1796, "It is therefore possible that the greatest luminous bodies in the universe are on this account invisible." This appeared to depend on the corpuscular theory of light, which gave way to the wave theory of light in the early 19th century, so the idea of "dark" or "invisible" stars fell from favor. It was believed that light, being a wave and having no mass, might be unaffected by gravity. Research into quantum mechanics, however, reignited interest in the light-as-particles view, ultimately resulting in the modern notion of wave-particle duality. Under this theory, light could be affected by gravity, so the question of whether light could be emitted from extraordinarily massive bodies was once again open. But the wave-versus-particle nature of light turned out to be a red herring. Under the "equivalence principle", it is known that anything, wave, particle, or whatever, that can be construed to have a trajectory, will have that trajectory bent by a gravitational field. And the term "black hole" was unheard-of. Stellar evolution and dynamics are quite complicated. Once a star has burned up all its Hydrogen, it may, depending on its size, burn Helium, and then heavier elements, all the way up to Iron. (Iron is the most stable nucleus; fission or fusion of Iron nuclei is not energetically favored.) As the material becomes more compressed, it is held up by the "electron degeneracy pressure" instead of the normal radiation pressure. The normal atomic structure, with orbiting electrons, is replaced by a collection of nuclei and unbound electrons, obeying the rules of quantum mechanics, particularly the Pauli exclusion principle. This pressure generally stops further collapse, leading to a white dwarf. White dwarfs may continue accreting matter from nearby objects. If the mass is over the "Chandrasekhar limit" of 1.4 solar masses, the gravitational force is too strong even for the degeneracy pressure, and the star becomes a supernova, neutron star, or black hole. The theory of this gravitational collapse was worked out in the 1930's. If the mass is greater than the Tolman-Oppenheimer-Volkoff limit of about 1.5 solar masses, the neutron star becomes a black hole. The properties of these objects (the "event horizon", and matter and information may only pass through the event horizon in one direction) were worked out in the 1950's. The exact solutions to Einstein's equation were worked out in the 1960's for rotating black holes (the Kerr solution), electrically charged black holes (the Reissner-Nordström solution), or both (the Kerr-Newman solution). Various theorems relating to thermodynamics were worked out by Stephen Hawking in the 1970's. The term "black hole" was coined by John Wheeler in 1967. The term caught on very quickly in both the scientific community and the public at large, helped by the catchy nature of the phrase. Because of the remarkable nature of black holes, the concept quickly became a staple of science fiction stories, "popular" science magazines, television shows, and movies such as Event Horizon (1997), The Black Hole (TV, 2006), and Interstellar (2014). The latter movie put a lot of effort into making the visual depiction of the black hole scientifically accurate. This was all theoretical at the time. There was no evidence that a black hole actually existed until the early 1970's, when scientists began to suspect that the radio source "Cygnus X1" was an actual black hole, and the 1990's, when scientists began to suspect that there was a black hole near the radio source "Sagittarius A*" at the center of our galaxy. (The name is pronounced with the word "star".) Since then evidence has accumulated that enormous black holes lie at the center of many galaxies. Black holes are literally invisible by traditional means of observation (that is, emission or reflection of some sort of radiation) and so cannot be directly observed, their nature is determined by other means. That said however, as particles near the event horizon their velocity increases and particles are drawn closer and closer together resulting in friction which caused a radioactive accretion disc which can be observed on the electromagnetic spectrum not visible to the eye. Since 1995, astronomers have tracked the motions of 90 stars orbiting an invisible object coincident with the radio source in the center of our galaxy, Milky way. The astronomers were able to infer that a 2.6 million sollar mass object must be contained within the radius of 0.02 light-years to cause the motions of those stars. Colliding black holes should produce gravitational waves, possible to detect experimentally. On 24 September 2015 the LIGO observatory made the first-ever successful observation of such event. The signal was consistent with theoretical predictions. The gravitational wave signal suggests that the separation of the two holes prior to merger was just 350 km, hence they must be small in size, leaving black holes as the most plausible interpretation. While matter and energy, even light, may not escape a black hole, Stephen Hawking has shown that when described by quantum mechanics, they should emit Hawking radiation, which absent of an influx of mass-energy would lead to the evaporation of the black hole in a burst of gamma rays. This radiation may be possible to observe. However all results obtained to date remain unverified and debatable. As it happened, the question became unavoidable shortly after the publication in 1915 of Einstein's general theory of relativity. Karl Schwarzschild solved the Einstein field equations in a way that describes the geometry of spacetime outside a spherically symmetric, uncharged, non-rotating distribution of mass. Well away from the center of this distribution of mass, the Schwarzschild solution closely matches the Newtonian model of a gravitational field; only close to the mass, where the curvature of spacetime is large, do significant differences between the two models appear. But if the diameter of the mass distribution is taken to be arbitrarily small, then the region of spacetime immediately surrounding the mass appears to take on extremely curious properties, properties so curious that many questioned whether they had any physical interpretation at all. Therefore, Schwarzschild showed that black holes were possible under the theory of general relativity. However, neither Schwarzschild himself nor Albert Einstein, who developed the theory of relativity, believed that black holes actually existed. Einstein even tried to re-work general relativity to render these singularities impossible. However, Roger Penrose and Stephen Hawking proved the first of many Singularity Theorems, which states that singularities must form if certain conditions are present. This demonstrated that, rather than mathematical oddities, singularities are a fairly generic consequence of realistic solutions to relativity: any mass with radius less than its Schwarzschild radius is a black hole. Since then, support for black holes among the scientific community has grown. c is the speed of light in vacuum. If the black hole has a nonzero electric charge, it is modeled by the Reissner-Nordström metric. Astronomical objects are generally electrically neutral, since otherwise they would attracted charged particles of opposite sign and quickly become neutral. Therefore, the Reissner-Nordström metric is largely of theoretical interest. A far more realistic situation occurs when the black hole is spinning (i.e. has nonzero angular momentum). Then the Schwarzschild solution is insufficient (as it was for the charged case), and instead one turns to the Kerr metric. Since astrophysical black holes are generically believed to have angular momentum, this is the solution that best describes them. Among the more interesting consequences of the Kerr metric is the phenomenon of frame dragging, in which the rotating black hole literally pulls nearby spacetime along with it. If one wishes to consider a black hole that is both charged and spinning, one employs the Kerr-Newman metric, which combines the Reissner-Nordström and Kerr metrics. Since the no-hair theorem states that (non-quantum) black holes are unique up to mass, charge, and angular momentum, the Kerr-Newman metric is sufficient to describe any classical black hole. Within a certain distance from an arbitrarily small distribution of mass — a distance now known as the Schwarzschild radius — the curvature of spacetime becomes so great that no paths leading away from the mass exist. That is to say, a test particle released inside the Schwarzschild radius will inevitably move in toward the mass, not because the force of gravity is great as in the Newtonian approximation, but because spacetime is curved to such an extent that no other directions exist. A particle within the Schwarzschild radius can no more move further from the central mass than it can go backwards in time. In fact, from the frame of reference of an infalling observer beyond the Schwarzschild radius, all directions that once pointed away from the central mass now point backwards in time. Once inside the Schwarzschild radius, further motion toward the central mass is as inevitable as further motion through time is for any other observer. For some time after the publication of the Schwarzschild solution, the validity of these results was hotly debated. In the solution's original coordinate frame, some terms in the equations diverged, or became infinite, at the Schwarzschild radius, leading physicists to wonder whether the results of the equations in that region had any valid physical interpretation. One proposed interpretation was that at the Schwarzschild radius, all time for the infalling observer would stop. This led to the use of the term "frozen stars;" it wasn't believed frozen stars were cold, but rather that they were literally frozen in time. Later refinement of the Schwarzschild solution demonstrated that the apparent infinities were merely an artifact of the coordinate frame chosen, and that an infalling observer in fact can pass beyond the Schwarzchild radius. In fact, the equations predicted he would notice no effects when doing so. But any attempt on the part of that infalling observer to communicate with the outside universe, say by sending a radio message, would be doomed to failure, as the radio waves would traverse geodesics through the severely curved spacetime and end up bent toward the central mass. From this, we can say that nothing that occurs within the Schwarzschild radius can ever affect events outside the Schwarzschild radius. This gives the Schwarzschild radius of a non-rotating black hole its other name: the event horizon. What actually exists inside the event horizon of a black hole is a question physics is unable to answer. Some postulate that within the event horizon exists a point of zero (or nearly zero) volume but infinite energy density, a point sometimes referred to as a gravitational singularity, after the notion of a mathematical singularity (a term referring to a point in an equation at which one would have to solve by dividing by zero, a feat presently impossible in mathematics) in a field equation. Others suspect that infinite energy density is a physical impossibility, and that a black hole contains actual finitely-dense matter compressed into a degenerate form, such as quark-degenerate matter. Since all black holes are surrounded by an event horizon which prevents any information or messages from leaving, all these theories are non-falsifiable; we can never be sure what the interior structure of a black hole is like. Black holes described with classical mechanics only have three intrinsic properties by which one differs from another: mass, electric charge, and angular momentum. Mass describes the amount of matter inside the event horizon. Angular momentum refers to whether the black hole is stationary or rotating around an axis. While the singularity of a non-rotating black hole may be an infinitely small point, the singularity of a rotating black hole would be in the shape of an infinitely thin ring. Quantum mechanics, which postulates that information loss cannot occur in a black hole, suggests properties beyond the three suggested by classical physics. Using this description, information must also be emitted by black holes. This radiation, referred to as Hawking Radiation, is thermal radiation that has currently only been described mathematically. Although radiation from inside the event horizon has not yet been observed, there is much phenomenon that occurs outside the horizon due to the black hole. Matter entering a spinning black hole is first swirled around by the black hole’s gravity, causing it to heat up and emit x-rays, which can be used to detect the black hole. In the supermassive black holes at the centers of galaxies, some of the matter does not fall into the black hole. Instead it is blasted into space in twin jets of hot gas perpendicular to the accretion disc, in a phenomenon known as an Active Galactic Nucleus. The red supergiant star V838 Monocerotis, an example of one type of star which may become a black hole. Stellar-mass black holes are said to form when stars more than ten times the mass of the Sun run out of fuel and die. The process of death occurs when stars that have fused the products of their own fusion into larger and larger elements, up to iron. The star then tries to fuse the iron core that forms as a result, but this does not produce enough energy to hold the outer layers of the star apart against the pull of gravity. When this happens, the iron core at the center of the star implodes in a supernova, and the outer layers of the star are blasted into space in one of the most energetic events in the universe—one star going out in a supernova can give off as much light as an entire galaxy. Not all supernovae result in black holes, but if the mass of the core is large enough, about 1.5-3.0 times the mass of the Sun (this value is termed the Tolman-Oppenheimer-Volkoff limit, and its value is not yet known to great precision), the leftover gravity of the shrinking core stalls the outward rush of the initial blast, and crushes the core into a point of infinite density: a black hole. Extremely small black holes, with masses of around 1015 grams, have been theorized to have formed in the early universe. Any sufficiently small primordial black hole would be expected to evaporate within the lifetime of the universe, but the rate of evaporation is not currently known with any certainty. At the opposite end of the spectrum, objects with the characteristics of supermassive black holes, millions or billions of times more massive than the sun, have been detected at the centers of many galaxies, including our own Milky Way. In our galaxy, the hypothesized supermassive black hole is in the constellation Sagittarius, and is known as Sagittarius A* (pronounced "A star"). Based on the extraordinary angular velocity of stars near the galactic center, Sagittarius A* is believed to be on the order of two to three million solar masses. It is unknown how supermassive black holes form, though several models have been proposed. One hypothesis simply begins with a black hole of stellar mass which grows over the lifetime of the galaxy that surrounds it. Another proposal describes supermassive black holes as a natural, in fact nearly unavoidable, consequence of galactic formation. To date, no one theory of supermassive black hole formation is favored over all others. Physicists trying to understand the theory of black hole formation have once again hit a dead end. Scientists have speculated that if a rotating black hole is large enough, a person could pass through the center of the ring-shaped singularity and possibly enter a wormhole. However, it would have to be a very large hole, for if it were not, the hypothetical astronaut would never survive to reach the event horizon due to tidal forces. Matter coming close to the event horizon of a small black hole undergoes a process called spaghettification, a term coined by Stephen Hawking in his book A Brief History of Time to describe extraordinarily strong tidal forces. Because the mass at the center of the black hole is so dense, the gravitational pull on the near end of an object is much greater than the pull on the object’s far end. This causes the object to be stretched out in a way resembling a piece of spaghetti, and generally torn in two. Because the general relativity equations are symmetric with respect to time, one can reverse the time parameter to yield an equation describing a hypothetical object which expels, rather than attracts, matter and energy. As this is the exact opposite of a black hole, it is called a white hole. However, there is no evidence white holes actually exist. If they generate new matter and energy, this would violate the Law of the conservation of mass. Therefore, some scientists have proposed that matter falling into black holes goes through a wormhole to emerge at a white hole. While such wormholes are allowed by general relativity, they would be extremely unstable, and there is no evidence that they exist. Scientists, who have been extremely eager to promote the idea of black hole existence, have shown a strong aversion to the white hole theory, even though, like a white hole, a black hole has never been observed directly. This may reflect an anti-creation bias on the part of scientists who are uncomfortable with the idea that matter and energy can be created outside of what scientific theories dictate should happen. Fundamentalists and creationists have used white holes to attempt to solve the cosmic time problem. Dr. Russell Humphreys used a white hole in his model of the universe during Creation week to allow millions of years to pass in outer space while only three days passed on Earth. Black holes are increasingly promoted by liberal publications, such as the science page of the New York Times, glossy magazines, and the movies the Event Horizon (1997), The Black Hole (TV, 2006), and Interstellar (2014). They are sometimes seen as sacred cows of atheistic science, and used to be commonly mentioned in atheistic propaganda. However both proving or disproving of the actual existence of black holes does not very obviously support any religion-related view. Black holes have been a device in science fiction ever since their prediction. Many sci-fi books, movies, and television shows use black holes as a method of travel (see the Potential Future Exploration section above) or as a threat to a space-going vessel. In at least one season of the show Star Trek: the Next Generation by Gene Roddenberry, artificially created miniature black holes are used as power sources for spaceships and natural ones as incubators for the young of an alien race. Neither of these uses has much of a basis in reality, of course. The term "black hole" is also used as a metaphor for a place that it is hard to get out of, generally containing a high concentration of something unpleasant. Ex: "The inner city is a black hole of crime and drug use." The "Black Hole of Calcutta" long predates the celestial use of the term; it was a horrible underground prison in Calcutta, India. ↑ They are assumed to come into existence from extremely large stars that collapse into a state of high density when they run out of fusion fuel. An object becomes a black hole when it lies entirely inside the Schwarzschild radius (see below) determined by its mass. For most objects, the Schwarzschild radius is very tiny compared with its size (for Earth it is about 1 centimeter), so the object could not lie inside that radius. ↑ The prediction of the existence of wormholes, and its naming in 1957, predates the prediction and naming (1967) of a black hole. ↑ Gillessen, S.; Eisenhauer, F.; Trippe, S. et al. (2009). "Monitoring Stellar Orbits around the Massive Black Hole in the Galactic Center". The Astrophysical Journal 692 (2): 1075. doi:10.1088/0004-637X/692/2/1075. Bibcode: 2009ApJ...692.1075G. ↑ Ghez, A. M.; Klein, B. L.; Morris, M. et al. (1998). "High Proper‐Motion Stars in the Vicinity of Sagittarius A*: Evidence for a Supermassive Black Hole at the Center of Our Galaxy". The Astrophysical Journal 509 (2): 678. doi:10.1086/306528. Bibcode: 1998ApJ...509..678G. ↑ Abbott, B.P. (2016). "Observation of Gravitational Waves from a Binary Black Hole Merger". Phys. Rev. Lett. 116: 061102. doi:10.1103/PhysRevLett.116.061102. Bibcode: 2016PhRvL.116f1102A. http://journals.aps.org/prl/abstract/10.1103/PhysRevLett.116.061102. ↑ Overbye, Dennis. "Physicists Detect Gravitational Waves, Proving Einstein Right", New York Times, 11 February 2016. Retrieved on 11 February 2016. ↑ Belgiorno, F.; Cacciatori, S. L.; Clerici, M.; Gorini, V.; Ortenzi, G.; Rizzi, L.; Rubino, E.; Sala, V. G. et al. (2010). "Hawking radiation from ultrashort laser pulse filaments". Phys. Rev. Lett. 105: 203901. doi:10.1103/PhysRevLett.105.203901. ↑ Grossman, Lisa. "Ultrafast Laser Pulse Makes Desktop Black Hole Glow", September 29, 2010. Retrieved on April 30, 2012. This page was last modified on 13 April 2019, at 16:21. This page has been accessed 121,358 times.